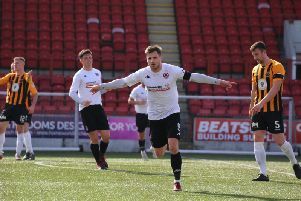 In an extraordinary match which saw six goals and the woodwork being hit eight times, Berwick Rangers lost a three goal first half lead to draw with Clyde. Berwick had led 3-0 after a hugely impressive first half but the hosts managed to pull the score back to 3-3 in the second half. Both sides had chances early on with John Neill shooting wide for the Gers from distance and Kris Syvertsen heading a John Rankin corner just over for the hosts. Clyde came withing inches of taking the lead on 13 minutes when Mark Lamont squared the ball in to the middle of the box from the left and John Rankin’s low guided shot rebounded of the post. Two minutes later, Clyde were denied by a spectacular save from Sean Brennan who got his finger tips to a curling Goodwille effort from the edge of the box which looked destined for the top corner. Then, just four minutes later, Berwick took the lead after some poor Clyde defending from a free kick which allowed one of Berwick’s two trailists on the day, believed to be Lewis Barr, to poke the ball home from close range after the home side failed to clear. The Bully Wee went right up the park from kick off, though, but again were denied by the frame of the goal as Syvertsen this time saw his first time shot from inside the box come back off the post. Clyde tried again and, on 24 minutes, Goodiwille managed to hold off three Berwick players inside the box and carved out space for a shot but his effort was high over the bar. Two minutes later and the home side could not believe their luck as they were denied by the post for a third time when Martin McNiff’s header from a Rankin corner came back off the near post. The ball fell to the feet of Syvertsen but his shot was cleared off the line by Rangers captain Robert Wilson. McNiff had another great chance from a set piece when a long free kick came in and the defender perhaps wasn’t expecting it to reach him as he headed wide while unmarked. Berwick might not have been creating as many clear cut opportunities as the home side but they did look dangerous and Clyde were once again made to for switching off at a free kick. The ball found the unmarked Ross Brown who put in a superb cross from the byline for Barr, who scored the first, to head home from inside six yards. Berwick then almost made it 3-0 two minutes before half time but it was their turn to be denied by the woodwork as Aaron Murrell’s shot came back off the underside of the crossbar. They didn’t have to wait too long and from yet another free kick they had their three goal lead with almost the last kick of the half. Paul Willis lined up the kick from in line with the corner of the box about 20 yards out and curled it in low at near post catching Blair Currie totally off guard. The whistle rang after Clyde kick off to a chorus of boos from the home fans. Just three minutes in to the second half Chris McStay had his head in his hands after neat work by Goodwillie inside the box who clipped it to him at the back post and, with the goal gaping, he somehow managed to drag it wide of the far post inside the six yard box. Then, just minutes after that, another great opportunity went begging as half time substitute Jack Boyle skied a shot from ten yards over the bar. The Bully Wee grabbed a goal back on 56 minutes when Goodwillie did what he does best and turned the Berwick centre backs inside out before firing in to the net from 15 yards. Then on 66 minutes Clyde were right back in the game as Dylan Cogill got on the end of a lovely free kick by Lamont to make it 3-2. Clyde had the bit between their teeth and the fans firmly back on side when they made it 3-3 as Lamont played in Rankin who slid the ball neatly in to the far corner of the net from the edge of the six yard area. Rangers continued and went up the park and created their first real opportunity of the second half with Currie producing two fine saves . As the game drew closer to the end Rankin had a shot from distance well saved by Brennan and Currie prevented Berwick retaking the lead when he denied the two goal trialist with his legs from close range. There was just enough time however for both teams to hit the post one more time as Ray Grant’s placed shot from distance came back off the far post and Jordan Orru’s cross from the left looped over the head of Currie and off the far corner of the sticks.